Before the Kalas and the other two can steady themselves, the homing missiles come flying at them again, just an instance of response incapability and the missiles have already arrived! With Ikaros, maintaining a distance between hehr and oneself isn’t a wise choice. Her abilities made her a nightmare to engage in far range compared to close range…. The flashes of dou qi shined every now and then as the missiles danced in the air. The two sides’ arms clashed and would hit the surrounding stone walls from time to time making the ones battling on the floor fight with their guards raised against possible stray shots. The battle between Ikaros, Kalas, Jared and Momiri dragged on with both sides switching between offense and defense. The sound of clamor also didn’t stop, it’s either Ikaros having her missiles completely blocked or Kalas and the other two using their battle skill with Aegis negating most of the damage. Ikaros may have the advantage of flight and excel in group fights but Kalas and the other two has numerical advantage. After fighting for so long the three could see that Ikaros is just the same tier as them! Being of the same tier and excluding that flight ability of hers and having one more armament than them there really isn’t that much difference between them. Even so, surely she can’t fight against 3 of the same tier without losing any grounds right? And yet, this angel like girl before them turned the impossible into possible! Kalas, Momiri and Jared don’t know what the hell it is but quite clearly this angelic girl isn’t that much stronger than Kalas who’s the strongest among them. So why, how is she able to achieve such a feat? What gives her the right? Why can she do something we can’t when we are the same? Why can she go up against 3 of the same tier? Based on what? Doe sbeing able to fly really add that much to one’s strength? Under the influence of envy and wrath the trio’s attack became more and more intense. Ikaros is starting to feel the pressure now as she frantically reacted to them. If Kalas and the other two thinks it’s a pain to deal with Ikaros, then Ikaros’ thoughts are mutual. She is holding on with her flight and group fighting capability but as time drags on she is starting to grow weary of this fight! At the end of the day, the enemy has the numerical advantage and they are of roughly same power compared to her. On the surface it might look like she’s fighting without losing ground but that’s only because Ikaros is not letting on about how hard this is. Whenever the barrier is broken she has to use her wing to block the attacks. She might be able to block them but some of the force from the battle skills are still transmitted from the wings to her body. On the surface, it might look like she’s okay but inevitably she has been hit! The original plan was that Ikaros would delay them until such time that he and Mikoto deal with the small fry and then they would gang up on the three. Ikaros on the other hand doesn’t have the same thought! The 3 before her is the enemy of her master and poses threat to him. Thus, they must be eliminated! That is what’s going through her mind at the moment. Wu Yan didn’t consider what she might be thinking but even if he did he wouldn’t worry too much about it, Ikaros has x1 Resplendent Breath on her so if worse comes to worst she can just drink it and turn the scales in her favor as she pleases! 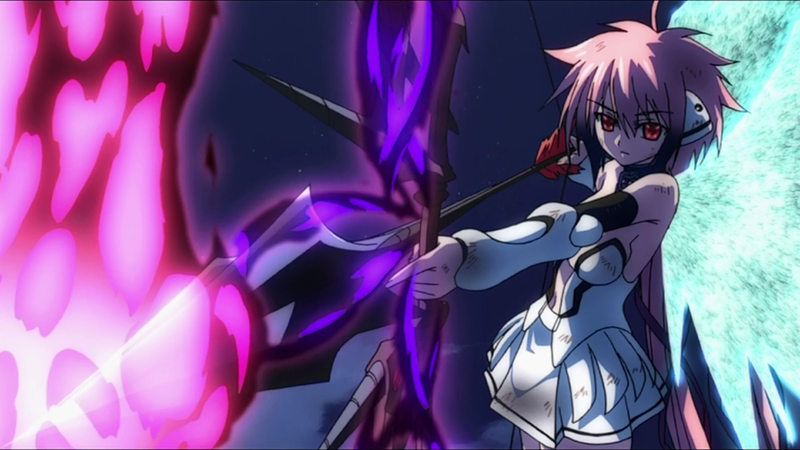 More importantly, Ikaros has not shown her true power yet! The status quo at the moment is that she’s able to achieve fight toe to toe against Kalas and the other two with her ability of flight and group fighting capabilities. That is indeed so but are there no other advantages she has? It would be wrong to assume she doesn’t! Wu Yan & co knows it, Ikaros still has her strongest ace up her sleeve! Ikaros deployed her barrier and then stopped the pincer attack from the 3 tier 8s with her light wings in her usual calm manner before promptly sending them flying with a wing slap! The difference this timeis that she didn’t follow up with salvos of homing missiles. She reached out her left arm and drew a thorny dark uniquely designed bow from thin air! Jared shouted at Kalas and Momiri when he saw the armament materializing. They gnashed their teeth as they vigilantly observed her movements. The purplish lights flowed all over the bow and black light started gathering at the tip of the arrow, charging up the arrow with the power of destruction directed aimed at Kalas and the other two! Just the act of being aimed made their hair stand on ends immediately, eyes opened wide and jerking their bodies! The light within her eyes condensed before she released her hand. The arrow morphed into a ray of dark light and flew towards the three! These words rang over and over inside their mind as they stared at the oncoming dark ray, they felt something cold creeping up inside them! Kalas roared and dashed for the side at a speed faster than he has ever mustered up before! Jared and Momiri recovered from their panicked state before channeling dou qi like their asses are on the chopping blocks and broke through their previous limit, making a quick escape to the side! The three didn’t even consider the option of blocking it because their guts are telling them even if they used their strongest battle skill along with their armament, they will still die! Their intuition is accurate and inadvertantly saved their lives…. The black arrow scratched past their bodies and struck the ground with an unimaginable speed….